Starting a manager story with FC Basel, so hope to keep you updated as I go, the major surprise here is the signing of Walter Samuel from Inter. He's a bit older now but he has experience at the top level of European football for many years. Also £19.5k per week isn't too bad for a player of his calibre. We've already qualified for the Champions League group stage, I'm glad that we don't have to play in the Champions League qualifying round, I'll post a screenshot of my Champions League group as soon as it is drawn. It should be fairly difficult because Basel can't be that highly seeded, as far as the formation goes I'm going to be less adventurous than I have been previously, settling with a 4-4-2 standard formation. I don't recognize too many big names from this team, other than Fabian Schar who always seems to join a decent Premier League team in my saves, a bit like Dragovic from Dinamo Kiev. Here's the transfer budget, not too sure what I'm going to be able to do with that, perhaps one signing will be all after adjusting the transfer budget for wages. My first offer is for a free agent which is convenient seen as Basel don't have a massive budget, one of the reasons I decided to go for Manuel Lucena was because of his leadership stats, something that I hope will help me out in Europe. Technically he's fairly decent, but just lacking a few physicals. Still on the subject of transfers, what I think has turned out to be a decent bit of business for us, we have had a £170k bid accepted for Fabrizio Miccoli. Again he's one of the older players on the game at 34, but he's a bargain and I feel he still as a lot to offer, he has fantastic technicals for our level and of course the physicals are the main weakness here again. The Fabrizio Miccoli transfer is now a done deal and he has become a Basel player, I will keep you updated on how he performs, it should be interesting to see him playing in Europe against some of the bigger teams. And our third and final signing is Diomansy Kamara who will be familiar to fans of the English game with spells at Portsmouth, West Brom and Fulham. I signed him for £475k from Serie C side Catanzaro. Or at least I thought he was the last signing, I have sold a couple of players meaning that the transfer budget is now back up to £1.43m, I managed to pick up Marco Materazzi who is 40 years of age from Chennai for £800, this now presents the prospect of reuniting former Inter CB pairing Materazzi and Samuel. 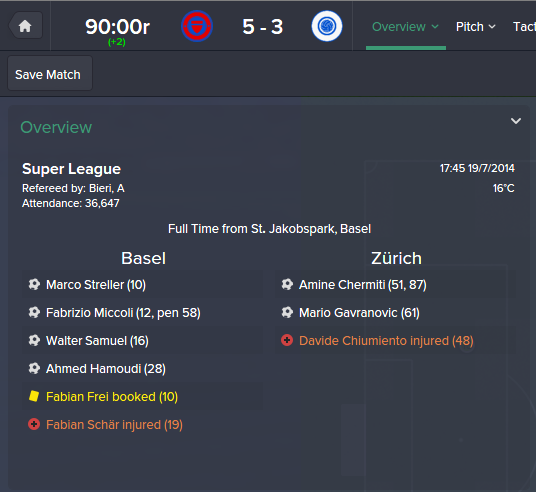 Basel defeated one of their closest rivals Zurich 5-3 in the first game of the season, they appeared to be running away with it after just 16 minutes, but Zurich found a way back into the game. Fabrizio Miccoli scored two goals on his debut and could have perhaps scored more, Walter Samuel also added a debut goal, in attack Basel were dominant but the defence needs some work. So far our scoring record has been phenomenal, however Basel have yet to face tough opposition, but I am hoping we can keep the goal scoring form up. We have added yet another signing in the form of 36 year old Argentinian goalkeeper Nicolas Cambiasso from All Boys in Argentina for a fee of just £75k, he looks like he could be a decent keeper for us. It has probably become apparent by now that all of our signings have been older players, we are looking to put in place an experienced team immediately, only time will tell whether this will pay of against some of the most physical and competitive teams from around Europe. Just brought in another experienced signing, this time it's Alessandro Lucarelli for £500k from Parma, looks like a fairly decent signing. The draw for the Champions League group stage is finally made, we are drawn alongside Benfica, Liverpool and Bate, I would say that we are most likely to finish third in the group which would qualify us for a place in the Europa League. This is it then my first Champions League game with Basel, this is what I've been waiting for, we are at home to Benfica who have some decent players. My prediction is that we might draw here, a win would be fantastic, let's see what happens. I didn't get a chance to register some of my players for the Swiss league because the registration period comes so early in the transfer window, so some signings may be making their debuts against Benfica. What a fantastic result that is, we beat Benfica 2-0 at home and it could have been 3-0 had the in-form Fabrizio Miccoli not missed a penalty, Walter Samuel was a rock at the back and he won man of the match proving that age is no barrier to him and the squad. This is the perfect start to the Group Stage and puts us in with a chance of qualifying. We had a fairly bad game away at Liverpool and we were lucky to only lose 2-0, we failed to register a shot on target as Liverpool dominated against us, however I expected that we would lose and on the day the score should have been a lot worse than it was. This is my second save, I wanted to test myself in the most difficult and competitive league on Football Manager and that is the Premier League, I have decided to pick Newcastle because I believe they should be a big club again challenging in Europe. Hopefully I can bring a bit of silverware back to Newcastle and finally bring and end to their barren trophieless run. As usual, I will go through some of my signings, I'm the kind of manager who likes to instantly bring in 5 or more players and send the same amount packing in the opposite direction. My first signing will probably be familiar to Football Manager players, it is that of Mirel Radoi, I had him on the game a few years back with FC Porto and he turned out to be one of my best players. This is my first starting line up of the season, my additions Mirel Radoi and Mark Noble come into the team to make their debuts, I'm also interested to see how Facundo Ferreyra, Emmanuel Riviere and Remy Cabella get on. The first game of the season is at home to Hull City so it should be a winnable game. The result was a bit of a strange one in the end, we fell behind to an early Jake Livermore goal, which meant that we had to chase the game a bit. Luckily we got back into the game but only managed a 3-3 draw when I was expecting a win, Moussa Sissoko was the key player getting two goals and the man of the match award, Facundo Ferreyra also managed to get a goal. 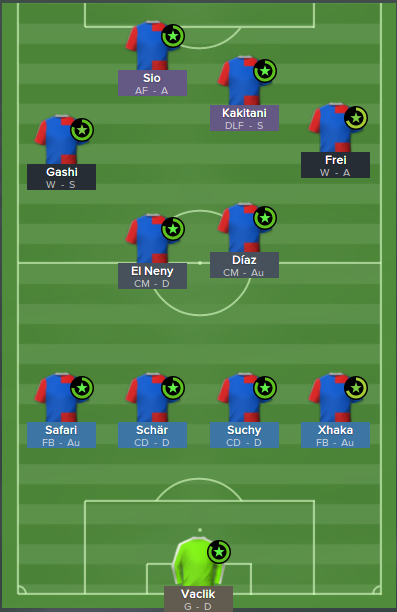 Next we are away to Crystal Palace, I have always found it more difficult to take points away from home on Football Manager so it could be quite a tricky one. We bounced back from the draw with Hull, with a 1-0 away victory over Crystal Palace, this is a good result as it could have been tricky. Moussa Sissoko score's again, he's made a good start to the season scoring 3 times in 2 games. Facundo Ferreyra scored all 4 goals as Newcastle come back from 2-0 down to win 4-2, I hear that in the future Facundo Ferreyra is supposed to be quite a good player, I've seen him playing for Man Utd on a save. That leaves my team very average after 8 games, in 10th place, Tottenham are top but I don't think that will last too long. There's not too much of a points difference at this stage, everyone's still in it, Newcastle need to start winning more for a European place. A good solid 3-1 win for Newcastle over Tottenham, which is good as Tottenham are in 2nd place in the league after 16 games, Newcastle move upto 9th. 6 points separate 3rd and 9th places in the league, so all is still to play for, Ayoze was in excellent form providing all 3 assists in the game. Ferreyra, Cabella and Riviere were all on the scoresheet, this is another good result after our recent 2-1 home win over Man Utd. We are suffering from a bit of an injury crisis at the moment, this could harm our chances this season, Moussa Sissoko who made a massive contribution to the team earlier on in the season has been out for some time now. Janmaat has had a number of injuries, but Davide Santon is available to play in right back, other first team players injured are Emmanuel Riviere and Mark Noble. This should make selecting a strong starting lineup more difficult. Newcastle strengthen their squad in the January transfer window with the signings of Scott Brown from Celtic for £1.9m and Sebastian Dominguez from Velez for £1.4m, he's Argentinian which can sometimes prove difficult when trying to obtain a work permit however he holds dual Italian nationality qualifying him as an EU citizen. More bad news, Facundo Ferreyra breaks his leg ruling him out for 5-6 months, Newcastle have terminated his loan contract as he his unlikely to play again before his loan expires in the summer. This is quite a blow to the team as he had been the top goalscorer for the club. Things went from bad to worse, Newcastle sacked me after a heavy 5-0 home defeat against West Brom, the team had gone on a long winless streak and were placed poorly in 14th. I think I can safely say that my first Newcastle experiment has not been a success. Welcome to my new Hull City save, Hull City have become my chosen team to start the game with on FM15, in my previous attempt I finished in 8th place for 3 seasons in a row. Let's see if we can better that this time around, my first and only signing is Lucas Pratto from Velez Sarsfield who I was able to sign because of his Argentinian/Italian dual nationality status, I think he's a bargain for £5.25m. He has been part of the successful Velez side that won the Argentinian league not so long ago, and contained the likes of Gino Peruzzi and Lucas Romero, Pratto is 26 and is a physically strong attacking option for me. We look fairly strong on our results so far, just to point out that I have been fielding a fully rotated squad in the Europa League, the Premier League is always my main priority over all competitions except the Champions League which we are some way off at the moment. We have managed to score an adequate amount of goals and our defence hasn't been too bad. Tom Ince is the man of the moment as he scores an hat-trick in Hull's 4-2 demolition of Liverpool, Hull have been in good form all season and this is a big step towards challenging for a European position, Hull currently lie in 6th place after 11 games and have extended their unbeaten record to 5 games. Okay so I decided just to get to the end of the season because it turned pretty bad, now this 1st season is out of the way hopefully the second one will be better, we finished 13th which was disappointing for me because I expected that we could finish as high as 8th. Two new signings now for Hull and they are both from Montpellier, and they are both central midfielder's, I bought them because Montpellier had scored a high number of goals and these players were involved in almost every game. They managed to register a decent number of assists and goals from centre midfield, this is an area in my team that lacks consistency, the two signings are Mike Jensen and Paul Lasne. Jensen managed 4 goals and 6 assists, while Lasne scored 4 and assisted 4. Interesting one here on my Hull City save, and Liverpool appear to be going back in time by signing Chris Kirkland from Sheffield Wednesday, the only difference is that he's 34 years old now and his last appearance for Liverpool came in the 2004/05 season 10 years ago. Emile Heskey next? I've just received a job offer from Crystal Palace at the end of my first season with Hull City, I can't understand the reason why I've been offered this job but it's not really the position I was looking for, so I will be turning it down. Another two signings for Hull City, Sebastien De Maio from Genoa £2.9m, and Manuel Iturra for £3.1m from Grenada. Okay, so my first Hull attempt didn't go that well so I've decided to try again with Hull City, I have sold a number of players including Brady, Chester, Elmohamady and Figueroa so that I can rebuild the squad and get money to buy some good players. So far I have managed to bring in Borek Dockal and Kevin Kampl, who are absolute bargains, Dockal cost £2.1m from Sparta Prague and is already worth £4.8m and Kampl cost £4.3m from Red Bull Salzburg and is already worth £7.75m. This new strategy of bringing in players from 3 star rated leagues could prove quite profitable for Hull City and give me a chance to make Hull a wealthier team.